The PAI-700 Vertical Card Compass is manufactured exclusively by Precision Aviation, Inc. in our Houston Texas facility under authorization by the U.S. Type 1 Directional Instrument, Non-Stabilized. The most obvious and primary advantage of the PAI-700 Vertical Card Magnetic Compass over fluid damped compasses is the easy-to-steer-by presentation! At a glance the aero designed lubber line on the lens enables one to view the entire 360 degree dial in its proper relation to flight. 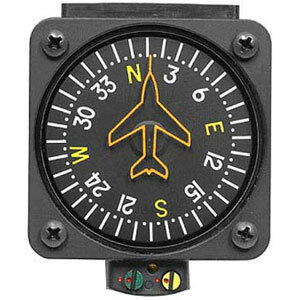 Yes, the PAI-700 Vertical Card Compass does satisfy the FAA requirement that each aircraft must have a magnetic compass. Yes, the PAI-700 is magnet driven thus it is subject to lead and lag, however, these tendencies are greatly reduced due to the absence of pendulosity. Yes, it is inherently stable due to the use of eddy current damping which is a natural phenomenon built into the basic design. No, the magnet cannot be pulled out of the gimbal, due to the use of a jeweled limit pin, which allows the compass to be flown inverted. However, this myth concerning pulling the magnet out of the gimbal showed up sometime back in an article and was later propagated via the internet in an article titled "Our Ally, The Magnetic Compass".